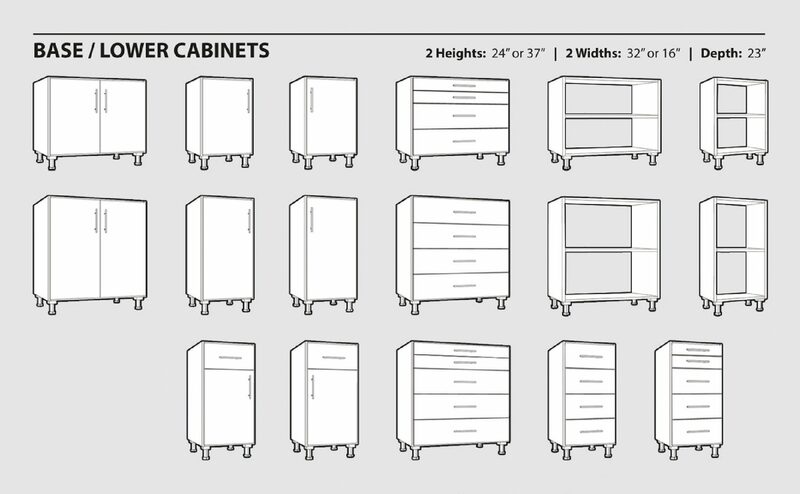 More Than 80 Cabinet Options Help You Design Your Perfect Storage! 80 Plus Cabinet Options Make it Easier to Design Your Perfect Storage! WorkSpace Garage Cabinets offer many garage cabinet choices. We offer a number of "standard" sized system configurations, which will fit the needs of many homeowners. But for some owners, that's just the starting point. If you need something more, or different, you can customize the b​est garage storage system until you have the exact setup you want. Need more cabinets? Just add them. Want a second or third tall storage cabinet? Just add it. Want two drawer units? Just swap 'em out. Want to design your own system configuration? No problem. And with our FREE Online Design Tool, we make it easy. WorkSpace Garage Cabinets have been designed with the flexibility to create almost any configuration you need to fit your garage and your needs. Once you've selected the cabinet configuration you want, you're ready to make everything look great! Choose from four cabinet box colors and five powder-coated door colors. Then add a garage countertop made of beautiful and durable Butcher Block or almost indestructible Impact Coating. Finally, finish everything off with HandiWall﻿ Slatwall and you can have the custom garage cabinets you've always wanted. Click the image to the left to download a pdf of WorkSpace Garage Cabinets to see everything WorkSpace Garage Cabinets have to offer﻿﻿﻿﻿﻿﻿.